We are proud to introduce an eco-adventure Can Gio forest tour to the mangrove forests of the Can Gio UNESCO Biosphere Reserve! Your scenic speedboat journey will take you from the heart of Saigon to the dense riverside jungles of idyllic Can Gio, via the verdant green canals of the Mekong Delta with beautiful landscapes. It is sure this is an enjoyable trip. 8:00am: Your guide will meet you in the lobby of your hotel and bring you by car to our boat at Saigon’s central pier, Bach Dang. 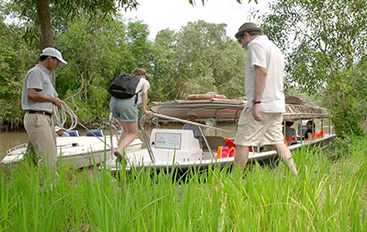 8:15am: You boat will depart Saigon for the lush, green tributaries of the Mekong Delta. A light breakfast of pastries or sandwiches, tropical fruit and Vietnamese coffee (ca phe sua da) is served. 8:45am: Visit Can Giuoc Market, a bustling local riverside market at the gateway to the Mekong Delta. Great photo opportunities! 9:45am: At around this time, the surrounding landscape will begin to change from lush riverside water palms to dusky mangrove swamps as you move from the Delta towards Can Gio Forest. 10:00am: Arrive at the Giant Bat Lagoon and explore gently by rowing boat, before trekking through the mangrove jungle. 12:00pm: Enjoy a delicious traditional Vietnamese lunch at a private riverside location, including the Mekong Delta speciality, Elephant Ear Fish. 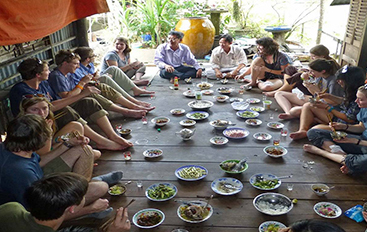 01:00pm: Arrive in Vam Sat Eco Park, where you will visit a crocodile reserve (and feed them if you wish!) and see monkey in their natural habitat, as well as enjoy crab fishing and bird-watching for exotic local and migratory species. You can also enjoy another mangrove jungle walk. 03:00pm: Depart Can Gio’s mangrove jungles for Saigon. 04:15pm: Arrive back Saigon’s central pier. Staff will take you back to your hotel by car. We loved the tour. Saw lots of birds, crocodiles, bats, monkeys and mangroves in their beautiful natural environment. Great service, good boat and really good explanations by the guide, make sure you get David as your guide on the tour! I've been to Can Gio several times, and was consequently unwilling to waste my money on one of the Vietnamese bus tours. The destinations selected and the quality of the service were beyond compare. A real view of the mangrove forest and Vietnamese life. Despite living in Vietnam for almost a decade I found myself learning new things about this town I call home. Special thanks to our guide Hang, and the whole team.